Balarte is situated in the countryside of Modica: 7 km from the seaside, 8 km from Modica, 20 km from Ragusa, 7 km from Pozzallo, 70 km from Siracusa, 160 km from the airport of Catania. 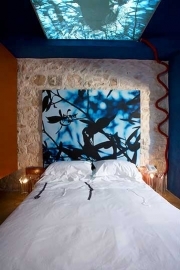 Balarte is situated ideal for trips to the Valley of Noto, the Cava d'Ispica, the Cava Grande Cassibile and the wild-life reserve of Vendicari with the picturesque fishing-village Marzamemi. 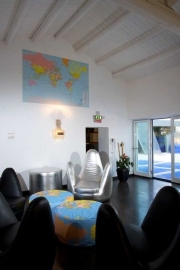 Hotel Balarte is a Art Hotel which was born in collaboration with the Accademia di Belli Arti di Catania. Hotel Balarte offers 5 quadruple suites and 2 triple superior. Seven rooms. Seven works of art. Seven different perspectives. Seven opportunities for expression and contemplation. The guest becomes participant in the chosen space: each room supplies an element of completion to the work, but it is the guest who, living it, provides the journey’s missing link. Balarte came into being in the wondrous Modican countryside; a land of ancient enthronization and baroque beauty. But it is infected by the expressive explorations of young artists who, unravelling the thread of memory, carry us back to yesterday’s youth, to those who, born in this land of legend, would look to the avant-garde movement and, in particular, to futurism as a possibility for cultural regeneration and redemption. Balarte also provides comfortable lodgings for pets/animals (dogs, cats, horses, etc), set in the surrounding greenery and adjacent to the hotel. Follow motorway Catania – Gela, exit Rosolini. Then follow directions for Ispica, Modica following SS.115, then following SP.45 direction Pozzallo or follow motorway slip road for the Syracusa-Ragusa exit. Take the SS.114 before turning onto the SS.194 in the direction of Lentini-Ragusa for Modica. Then follow direction for Modica Sorda, following SS.115 before turning onto the SP45 for Pozzallo. please send us for your reservation: type of credit card, creditcard number and validity.